White House chief of staff John Kelly and National Security adviser John Bolton erupted in a shouting match on Thursday, according to a report from Bloomberg News reporter Jennifer Jacobs. CNN reports that the pair of advisers clashed over a surge in border crossings after the president sided with Bolton. 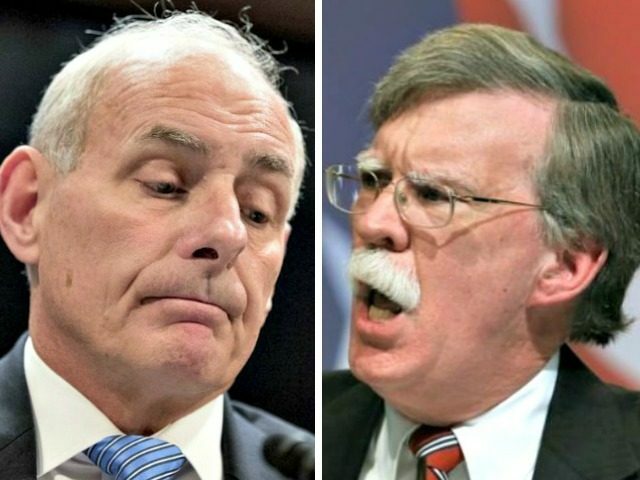 A White House source confirmed to Breitbart News that the argument occurred, noting that Kelly, Trump’s former DHS Secretary, and Bolton do not agree on the best way to solve the border issue. In recent days, Trump signaled that the border crisis was among the top issues on his mind as Republicans campaign for the 2018 midterm elections. The president threatened to send the military to the Southern border after a caravan of thousands of migrants made their way through Guatemala in the hopes of claiming asylum in the United States.